The controversy surrounding Saudi blogger Hamza Kashgari for tweeting "offensive" remarks about the Prophet Mohammad (PBUH) and the Saudi government's "harsh" reaction has led many people to ask the question what is behind all the commotion. On February 4, the 23-year-old business administration graduate posted three tweets in which he imagined himself speaking directly with the founder of Islam. "On your birthday, I will say that I have loved the rebel in you, that you've always been a source of inspiration to me, and that I do not like the halos of divinity around you," read his first tweet, translated here from the original Arabic. "I shall not pray for you." One of Mr. Kashgari's friends noticed the tweets when he woke up. As he rushed off to work, he said to himself, "I'm afraid for him," he recalls. By the time the friend ended his shift, he switched on his phone to find thousands of Twitter users calling for Kashgari's execution. Furious at what they saw as insulting the prophet Mohammad, critics also created a Facebook page called: "The Saudi people want the execution of Hamza Kashgari." The next day, a famous Islamic activist, Shaikh Nasir Al Omar, used his daily YouTube lesson - watched by thousands online - to call Kashgari a blasphemer. Kashgari's friends sent him a short message: Run. 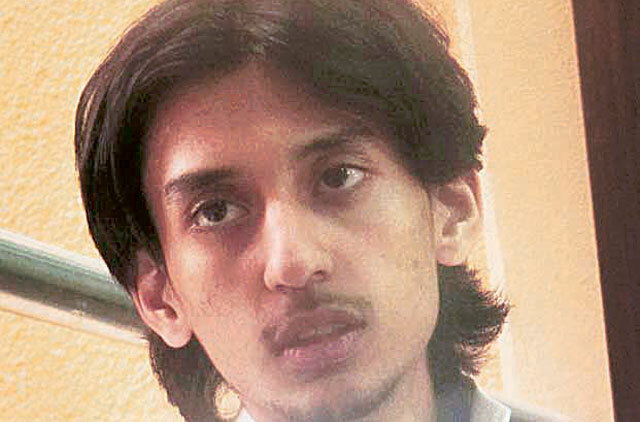 He fled, but only got as far as Malaysia before being deported back home to face charges of blasphemy, apostasy, and atheism - charges that carry a death sentence in Saudi jurisprudence. But Kashgari's trials are not just about three phrases of 140 characters or less. They stem from broader tensions in the kingdom of Saudi Arabia, where the monarchy has in recent years pushed back on the more conservative religious establishment but is now - in the wake of Arab revolts around the region - anxious to shore up support. "Certainly since the upheavals, there's been even more concern on the part of the regime to appeal to religious constituencies," says political scientist F. Gregory Gause, author of "Saudi Arabia in the New Middle East." Kashgari was an easy target, says Pascal Menoret, professor of Middle East Studies at New York University Abu Dhabi. "This is a very characteristic story of repression in Saudi," says Professor Menoret, author of The Saudi Enigma: A History. "Get rid of a young man - it's costless, and everybody's scared." Kashgari's friend described him as someone who was always walking close to the edge. Several years ago, he started attending meetings of intellectuals in the city who gathered to read and discuss religion and philosophy. Not long after, he became a columnist for the local paper Al Bilad, where his writing was sometimes critical of the government. He criticised flood relief when his city of Jeddah was overrun with water last year; he raised questions about the religious police. His prominent role as a commentator got him invitations to a number of social forums, including the Saudi Intellectuals Forum sponsored by the Ministry of Culture. "We were talking to him, and we told him, ‘Kashgari you are [a] known, famous person,' the friend recalled. " ‘Be careful with what you are writing.' I remember the look in his face when one of my friends told him that: He [was] staring at the wall, like he doesn't want to accept this fact [that he could be in danger.]" His tweets on the prophet's birthday were not new ideas; he had shared them before on his blog. But when he sparked public uproar this time when he wrote, "On your birthday, I shall not bow to you," according to a translation by Menoret. "I shall not kiss your hand. Rather, I shall shake it as equals do, and smile at you as you smile at me. I shall speak to you as a friend, no more." After the firestorm broke out, Kashgari fled his home in Jeddah, transiting to Jordan, then the UAE, then to Malaysia, where he was detained on Feb. 9 trying to catch a flight to New Zealand to seek amnesty. On February 12, authorities in the Malaysian capital of Kuala Lumpur deported him back home. In the days after his arrest, Kashgari's friends organised themselves on Twitter and Facebook, calling for the blogger's release. They have set up a website, Free-Hamza.com. An online petition circulated when he was in Malaysia, calling for the country to avoid extradition; 4,000 people signed. Now, however, organizing has become far more difficult: On Feb. 13, Saudi Arabian news outlet Al Hayat reported that anyone who was advocating on the young man's behalf online or in any social media could also be called before the courts. (This is why the Monitor cannot use their names in this article.) The announcement stopped any tentative supporters from speaking out. Malaysian lawyer Muhammad Afiq Mohamad Noor, contacted by Kashgari's family after his detention in Malaysia, has been trying to fight his extradition. In a phone conversation from Malaysia, he says that he tried but was unable to see or speak with Kashgari while he was in the custody of a special Malaysian task force set up to fight extremism and terrorism. Noor did, however, secure an order from the country's high court on Sunday morning that should have prevented the extradition. "Technically speaking the Malaysia government couldn't deport him to Saudi, because there was a court order preventing them from doing so," he says. Noor has since filed a motion against the extradition in Malaysian courts to which the government will have to respond on February 22. Earlier this week, the minister defended his country's decision, telling the Associated Press, "I will not allow Malaysia to be seen as a safe country for terrorists and those who are wanted by their countries of origin, and also be seen as a transit county. ''Now that Kashgari has arrived in Saudi Arabia, Noor says neither his lawyer there, nor his family, has had access to the accused. "He's incommunicado." There are no clear indications of what will happen next in his case, or when. Kashgari's Saudi-based lawyer told AAP news agency that he will be interrogated by the Ministry of Information. In an interview Tuesday morning, Human Rights Watch's Middle East director Sarah Lee Whitson said this could be the best hope. "We hope that if he is tried, it is by the Ministry of Information as a media offense, where the worst he would face is a penalty or a fine." Professor Gause, who teaches at the University of Vermont, says it's unclear what the protocol would be. "There's no good precedent to judge what this case will look like," he says, but adds that pressure, whether from human rights groups or diplomats, could exacerbate the situation. "Outside pressure would just further stir up the folks who have brought this case to the fore." "Hamza Kashgari's only chance not to face a harsh punishment," wrote Menoret in an open letter to the country's leadership, "is the recognition by the highest Saudi authorities of the benign nature of his posts on Twitter."